First off the name of this new version is WhiteFox [Vera]. “Vera” means true, authentic in Italian, which seems appropriate. Unfortunately only the True Fox layout will be available, as this is our first keyboard we are doing ourselves. We need to lower complexity and possible points of error especially in logistics. Bear in mind that we don’t have a huge company backing us now, so customer care and logistics is on us. The recommended switches are the Halo True and Halo Clear. These are the most beautiful Cherry MX compatible switched ever created, designed by the overly talented and personal super hero Jacob Alexander himself. So with Vera you can not only benefit of the best custom keyboard layout, but also of the best custom switch. A standard clicky blue switch is also available and if you want something more exotic (green, gray, zealio, …) you can grab the “switch-less” option, but of course you’ll have to source and solder the switches yourself. Stabilizers are now Cherry, mostly because they are easier to assemble. We had a lot of issues with Costar stabilizers in both production and assembly. I personally prefer the fragrance of Costar stabs, but we are playing it safe here, and have made sure that these Cherry stabilizers fit the keycap set perfectly. The PCB has been updated to improve the design and solve small issues, particularly with static discharge. Together with an updated firmware we should be able to deliver a flawless experience. The following is the NOT final list of keys that will ship with all WhiteFox Vera. What about perks and stretch goals? Glad you asked. We have many ideas and at the top of the list there are special, new color options for the WhiteFox, but —and it’s a big “but”— we need to see how the Kickstarter campaign performs. If there’s a solid interest and we quickly reach our goal, there will be surely some pleasant surprise! Congrats on another release! I’m super excited about finally being able to grab a whitefox. You mentioned in your last post about a dark-themed “nightfox” – is this an available option this drop? Let’s hope we make it! I’d instantly buy another with red/black keycaps. Congrats on the release. I really wished that the backspace was in the standard position, I don’t know if I could get used to it in the wrong place, especially with other keyboard having the standard layout. Are there any update on a wireless version of the Whitefox ? Should I wait next year for an other release with other layouts ? I just had an idea: would it be possible to include a 2U backspace that would mount on two switches ? That way I would simply have to disable one of the switch in the layout and I’d be able to use a normal backspace. In the extra keys, do you have a 1U Backspace included and a 1.5 ” \ | ” key if we want to swap them out ? I figure a 1U backspace might me less confusing if it’s in the right place to start with. Sorry for bothering you with all this. yes, those keys are all included. Will the extra keys as described on the Massdrop drops be shipped with each board? I’m especially interested int the 2mu command key and the keys with the square, triangle, and circle. yes there are quite some extra keys. I’m not 100% sure yet but we should also have 2x cmd keys. From what I understood, this is not on a universal plate right? so I really don’t have any chance of changing it to ISO DE ? I’d prefered your keyboard but will have to go with something else then. Congrats, this is awesome! As someone who was a victim of a bad static discharge, is there any chance that the PCB itself will be available? not for this kickstarter, but possibly later. Congratulations Matt! I’m IN!!! Best looking KB available, you have quite the artist’s eye for how keyboards should look. Hmm, December can’t arrive fast enough. Thank you Matteo for making the Whitefox available again. I was waiting for it for quite some time now. I really like the layout and the whole design. Go on with your fantastic work! Hello Matteo and the others! Just a few questions before I back the keyboard on Kickstarter, as I have always wanted one. I understand that the Whitefox will not have the USB-C option? Can I ask if Whitefox will a detachable micro-USB cable? And will it be possible for the Whitefox to have a USB-C option? Appreciate any replies or responses. The whitefox goes on micro-usb. The cable is detachable and you should be able to use a micro-usb to usb-c cable if you need to. USB-C will be included in future releases, not yet sure when. Thanks for the quick reply Matt3o! I’m really happy the Whitefox is back. Thanks for your time and effort reading the comments. You are awesome. Seeing one of the comments about a potential bluetooth version of the Whitefox just made me so excited (in all the wrong and right ways). Second silly question also for you Matt3o.. in terms of noise/sound, which is quieter – Halo Clear or Trues? they are both pretty silent. One just a tad stiffer than the other. Congratulations on bringing back the WhiteFox; I hope this is a more satisfying experience for you than your time with Massdrop. Would it be possible to add a 2U backspace to the keycap set? I’m going to be getting a kit and having a plate made so I can build a Vanilla layout, but I like the look of those keycaps and would like to use them. Also, what thickness of material will I need to have my plate cut from to make sure it fits together properly? I realize I could just buy the Sentraq plate, but it lacks the switchtop removal notches and I intend to swap springs multiple times. the plate is 1.5mm. Regarding the backspace, I’ll talk to IC about it, but being a 2u key it would be expensive so I can’t promise. What would I need if I wanted to attempt making a vanilla/aria layout myself? Because I really don’t want to use the true fox layout and just CANNOT wait till next year for another run (IF there’s another run). the PCB supports pcb mounted stabs. So technically you could dremel a piece of aluminum and mount the 2u key together with the stabilizer. Doing so you’d get an Aria. Guess I’ll just jump in and see what happens. Worst case scenario I get used to the true fox, or use a 1u backspace. the whitefox position for backspace will feel totally comfortable in a matter of minutes! Believe me, that is the natural position for backspace! 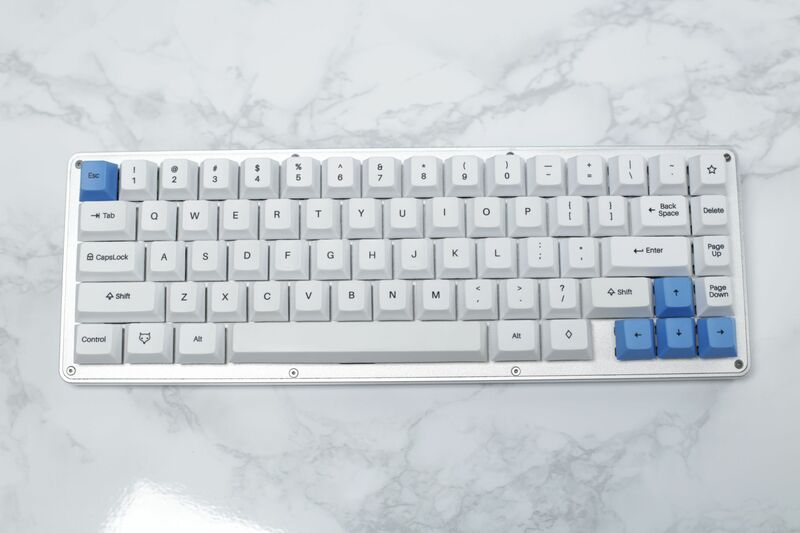 I’m so glad to see that the WhiteFox made it to Kickstarter! I would love it if there could be an option with ISO layout in the next run or as a stretch goal. That would be so very very awesome! Matt3o! Congratulations on such a successful first 2 days on your kickstarter campaign! I’m so glad this is coming together. thanks! we are pretty excited but a lot of work awaits! Awesome to see a successful KS campaign. +1 on a black version with USB-C and additional layouts! Grande Matteo spero di riuscire ad acquistarla in tempo se riesco a mettere da parte dei soldi.. questa volta non posso perderla!! Ooh, I was holding out for the kit-edition, but seeing as the fully assembled version is only $10 more, and the kit version comes without switches. Small question, couldn’t quite read it: will there be a USB-cable included in the package? yes, the USB cable is included! Congrats! Finally the WhiteFox is back! I would have loved a unassembled kit incl. switches. Why not add this to the kickstarter? Pretty please with sugar on the top..
Congratulations with the progress! I would love to join, but sadly I’m not really interested in the offered layout. I hope we will see a Vanilla layout soon! Don’t worry, hopefully in the future we’ll offer more layouts! I’m ready as soon as the layout I want is available! I’m not much of a kickstarter person, but I backed this as fast as I could. I have the utmost respect and faith in you and input club so I knew this project would succeed. So happy to get a white fox of my own, and im glad its going to be a vera! Congratulations on your progress and success and I wish you guys the best of luck! On a side note is there instructions on how to make the origami fox anywhere? That thing is adorable! Take 2 on ascci art? Thanks! and don’t worry the WhiteFox origami is super easy to do. I think I’ll post a video soon! CONGRATS! As my favorite board I am glad to see it make a return and under your control! and hot-swappable switches like the K-type has would probably make me buy 2! My heart just dropped when I read it’ll only be available in the true fox layout. I’m kicking myself for not jumping on the last drop, I really loved the vanilla and Aria layouts. I wonder if anyone on geekhack and the like would be willing to part with theirs and sell it to me, or if I could Mcgyver some way to change the layout? Why are you shipping to Australia but not New Zealand? You’re killing me here, matt, we’re just across the pond! SHUT UP AND TAKE MY MONEY, MATT. I’ll wait eagerly to hear back from you. Otherwise I guess I could just have it shipped to NZPost’s warehouse in the states and have it sent over with some stuff I want to buy from amazon. Any chance of bringing back LEDS or cherry switches? Considering that a full set of cherries would cost more than the reduced price for no switches ($10) I’d really like to see the old options come back. Not at this stage, sorry. We are trying to keep the kickstarter as simple as possible. Great work on this product! Looks amazing. I’m torn between this or the K-Type from Input Club though. As someone who hasn’t quite taken the plunge into this hobby can you help me decide or at least weigh in on these two? I know Input Club is a friend of yours so hopefully you can give an unbias opinion. For reference, I currently use a TKL with cherry reds. ohmy. this is such a personal decision, it’s hard to give you an advice. 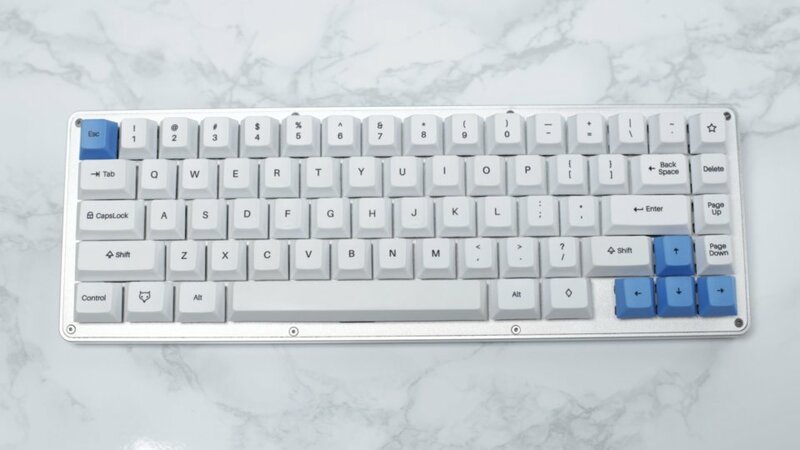 If you like compact layout… totally get the whitefox! Is the PCB for the WhiteFox compatible with holtites (do they fall through or not)? I see it ships to South Africa for 25 USD. Is this via normal post? I was really heartbroken when I clicked the kickstarter page and found out that it does not ship to Indonesia. If it is not too much to ask for, could the WhiteFox or NightFox be made available for us Indonesian? It is actually really close to Singapore, Malaysia, and Australia. Is it still possible to buy a WhiteFox? Do you have plans to release /dev/tty caps for WhiteFox? thank you for giving us the whitefox! I am pretty new to the mechanical-keyboard-game, but got hooked very fast. For some time now, I am searching for the device that would fit me the most… and am inevitably drawn to your creation. For me it’s the layout combined with the programmability, rather than the switches or caps. Are you working on said option? And if yes, how does it come along? Thanks a lot! Greetings from Germany. yes we are working on the wireless option, but no ETA, sorry!